Mandela was one of the signatories of the Freedom Charter, which among other things demanded the nationalization of South Africa's resources and reparations for the theft of African land by the Europeans. He was a member of the South African Communist Party, as were other leaders of the African National Congress. We should have known that the South African government wasn't letting him go free without exacting a huge price. It is difficult to look the gift horse in the mouth, but the silence created a vacuum which made it easier for the rule of international capitalists to stay in place, even as they appeared to give up political control. Mandela's early history is something to honor and remember but now his memory comes wrapped in the poison pill of acceptance by the corporate media and disreputable democratic and republican politicians. Now when right wingers condemn Mandela as a communist, his admirers cringe and deny what is true. Instead of examining what a communist is and why the party was supported by the movement, we see black people instead take the position of our enemies and use the word as a slur. We must remember that scorn from certain quarters is a badge of honor. Contrast the reaction to Mandela's death with that of the late Venezuelan president Hugo Chavez. While Chavez was equally beloved around the world, the American government gave no glowing tributes and sent no high level delegation. Chavez was every bit as deserving of praise and honor but unlike Mandela he succeeded in standing up to empire. He personally protested against George W. Bush and even called him the devil at the United Nations. Hugo Chavez prevailed when American presidents wanted him out of office. He won re-election and shamed this country when he donated Venezuelan oil to help poor Americans stay warm in the winter. Of course Barack Obama, George W. Bush, Jimmy Carter, and Bill Clinton were absent from his funeral. Nelson Mandela had difficult choices to make. He chose to accept an IMF loan with strings attached that kept millions in poverty. He and his successors turned their backs on the Freedom Charter. No one can know his intentions but the results of those decisions were disastrous for the masses of black people in South Africa. 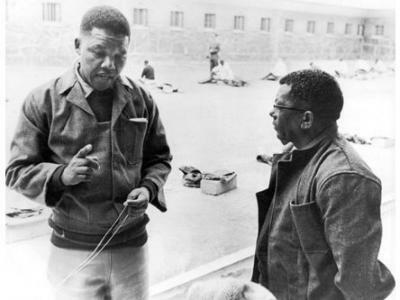 Mandela's release from prison should have been seen as a new stage in the struggle and not the end of it. Those of us who came of age during the anti-apartheid movement and who truly loved the man have to admit the short comings of love when liberation is at stake. There are many lessons to be learned during this time of mourning. Our emotions play an important role in inspiring us to take action against injustice but they can also betray us when we lack an understanding of what liberation really is. Liberation may or may not come with a presidential inauguration. It certainly hasn't come if the usual suspects in the corporate media, Pennsylvania Avenue and Downing Street suddenly give words of praise. The success of certain individuals is not liberation either. There are now black millionaires in South Africa but that does little good to the impoverished masses. Liberated people don't live in squalor. They earn more than a living wage. They need not fear loss of job or life if they protest their salaries or working conditions. They have free health care and education. They don't fear incarceration and they don't live in stratified societies. They live in safety and the law treats them all as equals to one another. They can protest and oppose the power structure without fear of repercussion. South Africa doesn't fit these criteria, neither does the United States, and we who love freedom and justice shouldn't spare anyone when we express these simple and obvious truths.